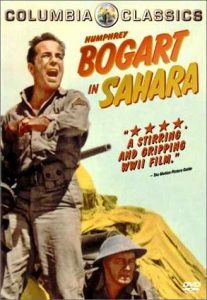 Sahara is, in short, an excellent movie —  set in World War II, in the desert conflict, it involves a ragtag multi-national group of Allied soldiers (Humphrey Bogart, Bruce Bennett, Lloyd Bridges) as well as their Italian prisoner of war (played memorably by J. Carrol Naish) who come upon an oasis in the desert —  a crumbling ruin. The ruin has a cistern —  not a well, but a storage place for water, that’s nearly dry. The GI’s no sooner find it than they’re surrounded by Nazi soldiers, who are dying of thirst —  but are armed to the teeth. Negotiations over the water are the conflict in the film, with the untrustworthy Nazis proving themselves double-dealing, willing to violate a truce flag and betray their own allies. It’s an excellent film, with excellent acting all around, and well worth watching —  it’s highly recommended. Hollywood made few movies about the desert conflict during World War II — and curiously, two that they did (Five Graves to Cairo is the other) were remakes of films set elsewhere. John Howard Lawson based his script on a prewar Russian film (Lawson would later be blacklisted, incidentally) about a military patrol besieged by Asian bandits. The situation readily lent itself to a wartime parallel and became one of the most engrossing story lines of its era. 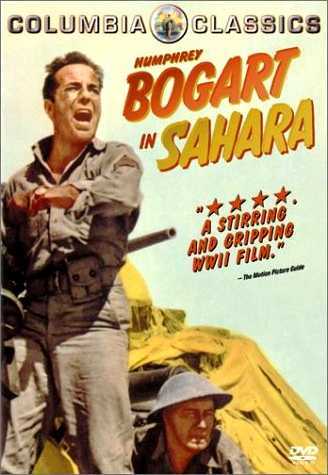 A U.S. tank crew and their commander (Humphrey Bogart), separated from the main force, make their way through the desert, accumulating a veritable United Nations of stragglers as they go: a few of Montgomery’s tommies (including that old limey Lloyd Bridges) and a towering African (Rex Ingram) and his prisoner — a garrulous Italian (Oscar-nominated J. Carrol Naish) who can’t wait to tell his new friends about his relatives in — Peets-a-bourg Pennsylvania. —  They come upon a ruin, the onetime site of an oasis, and almost immediately find themselves defending it against a small army of Germans who believe there’s still water to be had there. Yes and no — there’s a biblical wrinkle to this tale — and the standoff between the polyglot democrats and the Nazis who far outnumber them is a fine, sun-baked study in suspense. Jimmy Doyle: [First Lines] U.S. tank detachment unit 5. Repeat message. U.S. tank detachment unit 5. Repeat. Over to you. Over. Giuseppe (J. Carrol Naish): My wife, my wife and bambino, that’s my baby. Capt. Jason Halliday: It’s a nice picture. You must be very proud of them. I’ll see what I can do. Capt. Jason Halliday: Sgt. I’d wish you’d change your mind. This man is a prisoner of war and, as such, he is entitled to certain rights. We’ve got to take him with us. We can’t leave him here to die. If we ask the men I’m sure they’d agree. Sgt. Joe Gunn (Humphrey Bogart): Mm-hum. They’d agree now. What about when they’re starving to death and dyin’ of thirst? It’s why you put me in command. To look ahead. Capt. Jason Halliday: But, this is a matter of a man’s life. Sgt. Joe Gunn (Humphrey Bogart): You’re wrong Doctor. It’s the matter of the lives of ten men. We’ve got a long ways to go and we need every crumb of food and every drop of water. I’m taking the Sudanese along because he’s a pretty soldier and he’s entitled a share with the rest of us. I’m NOT taking on a load of spaghetti. He’s walked this far and he can walk back. That’s the end of it. Sgt. Joe Gunn (Humphrey Bogart): [Speaking about his tank’s engine that won’t start] Well, you don’t feed her enough. It’s like a dame. You don’t feed ’em they won’t do nothin’. Jimmy Doyle: You think she’ll pull us out alright? Sgt. Joe Gunn (Humphrey Bogart): Oh, well, it all depends on the way we handle her. It’s like a dame. But no dame ever said anything as sweet as this motor’s going to sound to us when she gets rollin’. Capt. Jason Halliday: [Referring to a captured German POW] He doesn’t want to be touched by an inferior race. Sgt. Joe Gunn (Humphrey Bogart): Oh, tell him not to worry about him being black. It won’t come off on on his pretty uniform. Sgt. Joe Gunn (Humphrey Bogart): Go ahead and search him. Sgt. Joe Gunn (Humphrey Bogart): You heard my offer. Water for guns. Giuseppe (J. Carrol Naish): Mussolini is not so clever like Hitler, he can dress his Italians up only to look like thieves, cheats, murderers, he cannot like Hitler, make them feel like that. He cannot, like Hitler, scrape from the conscience the knowledge that right is right and wrong is wrong, or dig holes in their heads to plant his own ten commandments: steal from thy neighbor, cheat thy neighbor, kill thy neighbor. Capt. von Schletow: You dare to insult the FÃ¼hrer? Giuseppe (J. Carrol Naish): That would take an artiste —  I am but a mechanic. Giuseppe (J. Carrol Naish): But are my eyes blind that I must fall to my knees to worship a maniac who has made of my country a concentration camp, who has made of my people slaves? Must I kiss the hand that beats me, lick the boot that kicks me, no! I rather spend my whole life living in this dirty hole than escape to fight again for things I do not believe against people I do not hate. As for your Hitler, it’s because of a man like him that God —  my God —  created hell! Waco Hoyt (Bruce Bennett): I see you whittled them down a bit. Sgt. Joe Gunn (Humphrey Bogart): Yeah — ¦they whittled us down too. Sgt. Joe Gunn (Humphrey Bogart): [Last Lines] Yeah. They’d want to know. Halliday, Doyle, Tambul, Williams, Stegman, Frenchie, Clarkson. We stopped them at El Alamein.